Here's links to my full gamer and notebook from the Wild's 2-0 loss to the Chicago Blackhawks on Saturday at Xcel Energy Center. Now for some postgame fodder. The Wild certainly had opportunities Saturday but couldn't convert any of them. Mikael Granlund said misfortune isn't the only reason behind that. Both goalies were "out of this world," according to Wild coach Bruce Boudreau. 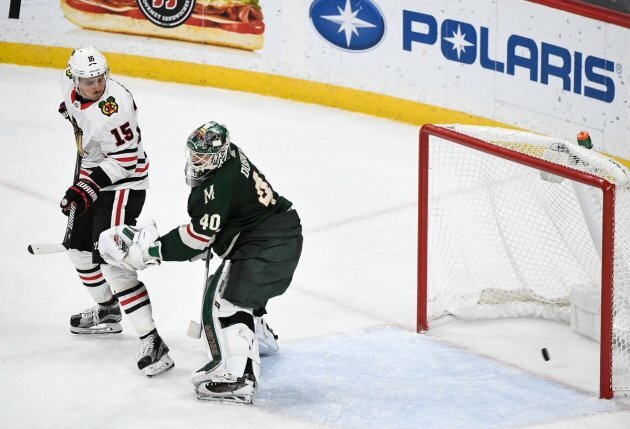 The Wild's Devan Dubnyk stopped 33 of 34 shots while Chicago's Corey Crawford managed 24 saves in his second-consecutive shutout. "I thought we've been playing pretty good on the power play, moving around pretty quick and making their guys move around and not making it easy on the PK, giving some different looks," Crawford said. "We're also trying to keep it simple, put the puck on net, go to the net. That was a big one for us, obviously, against a team that plays pretty solid D. Their goalie's playing good, too. Just one of those games where I felt like whoever was going to score first was going to get it. It's a good road win for us." Chicago had been on a three-game power-play goal drought but now has ones in two-consecutive games. Meanwhile, the Wild hadn't had one in four games until Thursday's score, but again blanked Saturday in its two chances. But coach Bruce Boudreau did say before the game he was pleased with the energy Nino Niederreiter brought back to the first unit, which was evident again Saturday, and expects Charlie Coyle to do the same on the other unit once he returns in a few weeks from a broken leg. As for Coyle, Boudreau said the team misses him "a lot." Well, Coyle certainly couldn't have hurt in Saturday's loss to the divisional rival. The Wild is off Sunday before they fly to Boston, where the team begins a four-game road trip. I'll catch y'all ahead of the next home game Nov. 14 against Philadelphia.